Listed in older catalogs as Santolina virens. 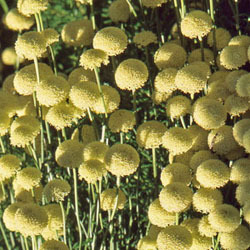 The narrow foliage is bright green and the flowers are in light yellow flower heads typical of the other Santolina in size and shape. Useful as a dried flower. Growth is more sprawling than most other santolina except the grey santolina. Categories: all potted plants, medicinal herbs, Potted Plants, More..